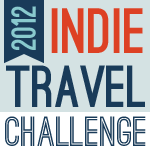 It’s Week #4 of the 2012 Indie Travel Challenge. 1 month down, 11 months to go! When the weather gets cold, do you prefer to head to sunnier locales or do you love the outdoor adventures or off-season prices of winter? Warm or cold, what’s your dream winter travel destination, and do you have any travel plans for the coming months? This past year, my parents moved from California to Colorado. Previously, flying to California was my sunnier locale to escape some of the winter blues (& greys). This past holiday season was the first journey to Telluride, Colorado. Flying from a snowless December Toronto winter to a high-altitude–snowy Telluride was a little surreal. Let me sum it up for you: I didn’t bring sandals with me. I bring sandals with me everywhere. I don’t think I prefer one or another as long as I get to try a few new things. This past trip, I went snow shoeing for the first time! & went skiing for the first time in maybe 15 years (talk about rusty…). It is nice to arrive somewhere & just have the climate be different. Something new.